[R247R, Montana Snowbowl] is seeking to expand, doubling the acreage and capacity of the ski area. Lolo National Forest has opened up a comment period on the draft Environmental Impact Statement (DEIS) that analyzes potential impacts of the expansion. The expansion proposal in the DEIS calls for nearly doubling the size of the existing ski area, bumping it from 1,138 acres to 2,243 acres. Most of the new terrain would service beginner and intermediate skiers. The number of lifts would double, too, from four to eight with the number of ski runs increasing from 52 to 80. The additional lifts, terrain, and runs would increase the daily capacity from 1,500 skiers to 3,066 skiers. Other parts of the expansion proposal include the addition of a new snowmaking reservoir, a maintenance building, and a new lodge. 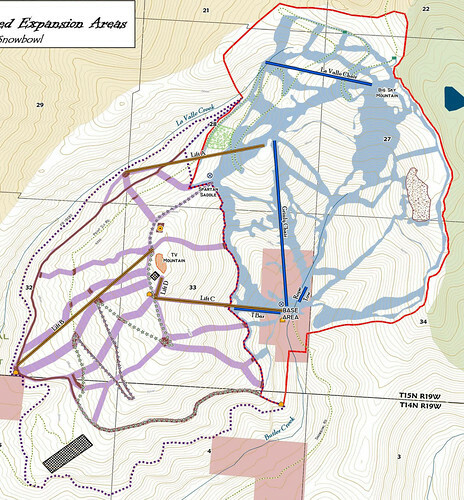 The proposed expansion sits on Lolo National Forest's TV Mountain, topped with communications towers and located west of the current ski area. The west side of TV Mountain housed the original Snow Park Ski Area, which operated in the 1950s, but closed in 1960, according to the DEIS. The ski area re-opened in 1961 in its current location to access "higher elevation terrain, better snow conditions, and greater vertical drop." The local town-Missoula-used to support two ski areas, but Marshall Mountain, which serviced primarily beginner and intermediate skiers, closed in 2003. Visitation at Montana Snowbowl has climbed since then, but options for beginner skiers and snowboarders are limited. The ski area "has a mix of terrain sufficient for advanced and expert skiers, but it lacks sufficient beginner and intermediate terrain to meet local demand," stated the DEIS. "Access to most of this lower skill terrain is complicated because it is located mainly on the upper mountain." The location of the beginner terrain on the upper mountain forces a "challenging" 2,600-foot vertical descent on two-mile-long trails to return to the base lodge and services. The comment period on Montana Snowbowl's expansion plan is open for 45 days following when the Federal Register notice is published, which was expected to be March 11. The DEIS document is published on the Lolo National Forest website. A public open house with opportunities to learn more about the expansion is scheduled 5-7 p.m., March 30, at the Grant Creek Inn, 5280 Grant Creek Road, Missoula.